One of the first questions I get asked after showing someone PowerPivot for the first time is “Can I add new data to a PowerPivot table that already has data in it?”. 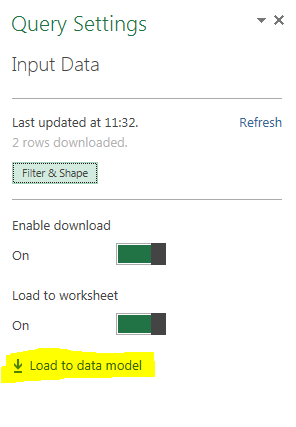 Out of the box, of course, the answer is no: when you process a table in PowerPivot you have to reload all the data from your data source, you can’t just append new data (unless you’re using copy/paste to load data, which isn’t a good idea). However, there are a lot of self-service BI scenarios where the ability to do this would be extremely useful: for example, you might want to scrape stock quotes from a web page every day and then, in an Excel workbook, accumulate that data in a table so you can analyse historical stock prices with PowerPivot. I ran into a scenario very much like this last week and I thought that Data Explorer should be able to help here. It can, but it’s not obvious how to do it – hence this blog post! Now as I said, this is just a super-simple example and in the real world you’d need extra functionality to do things like delete rows you’ve already loaded and so on; but that’s all doable I think. It’s also worth mentioning that I encountered some strange errors and behaviour when implementing this, partly due to Data Explorer still being in preview I guess, so if you want to recreate this query you’ll need to follow my instructions exactly. You can download the sample workbook here, and the csv file here. I really liked this blog; made me think of accumulating a fact table in excel with parameterized queries; which spawned a whole other train of thought. It doesn’t appear to have gotten a get a ping back but I’m going to reference it on my blog southbaydba.com. Thanks for taking the time to do write this up! 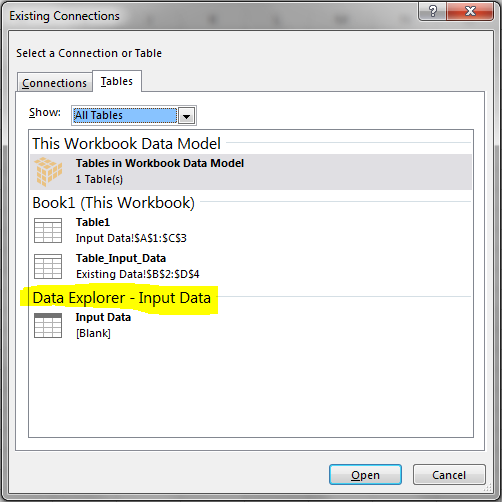 The idea of moving data from the data model back into excel is great but a huge inconvenience for large workbooks. I imagine this process would take a long time in those cases? I hope they solve this by adding more features that interact with the data model. Yes, it would be a problem with large amounts of data. As a result I think this technique is a bit too much of a hack to use in the real world. Hi Chris! Thanks for this post. Do you know if there have been any updates that would allows us to handle this scenario more efficiently (as opposed to moving the data from the data model into a worksheet)? No, there aren’t any. I don’t think it’s a scenario MS is going to concentrate on – if you want incremental loading that’s going to be when they ask you to upgrade to SSAS Tabular on the server. There’s nothing from Microsoft that I know about; there are some other tools I’ve seen, like import.io, but I don’t know if they allow you to accumulate data rather than just scrape it. **The operation failed because the source database does not exist, the source table does not exist, or because you do not have access to the data source. OLE DB or ODBC error: [Expression.Error] A cyclic reference was encountered during evaluation..
An error occurred while processing table ‘WallysHistory_Weeklyfilescombined’. It should work in Excel 2010 but I’m afraid I don’t have it installed so I can’t test it. Are you sure you are using the right tables? That error sounds like it could be caused by you using the table loaded from Power Query as the ‘existing’ data input, not a table sourced from Power Pivot. Does the history table have to be in another file? Or is it possible to source both tables within the same file? I’ve tried it, but it just loses the history. Chris, I have been assigned a project where I’m summarizing huge amounts of labor data into one excel worksheet. Heres the scenario I’m going back several years and I have collected the data for the different plants and separated them into different worksheet. Theres about 5million rows total. 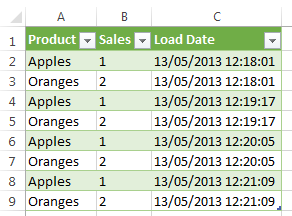 I appended these using the power query function and uploaded the data to the data model to create a powerpivot. The problem is that for the current year data it is updated montly. There is so much data that I was hoping to only store it in the model and delete the tables in the worksheets and keep the table for current year and add the latest data each moth and then refresh the data adding only the new. Then at the end of the year delete the table for that year and append a new year and so on. It seems as though if there were a way to delete query connections this would be simple because it would only refresh the existing connections but the trick would be keeping the data stored in the model from disappearing. Do you have any ideas on how to make this scenario work? No, there’s no feasible way of doing this in Excel I think. Maybe you should use separate workbooks for each plant, and a further Excel workbook (with no data on any of the worksheets) to hold the consolidated data in the Excel Data Model.